Patricia Cluss of Standing Firm, which advocates for businesses to understand the workplace cost of partner violence, urged city council to add domestic violence situations to the bill as a valid use of paid sick time. A large crowd gathered in council chambers today to speak in support of or in opposition to a bill that would require employers to provide workers with mandatory sick time — a measure council wants to pass before it breaks for its summer recess. "It's the clear intention of council to vote on Monday," Council President Bruce Kraus said after hearing public testimony. "I'm not going to mislead you and say it isn't." 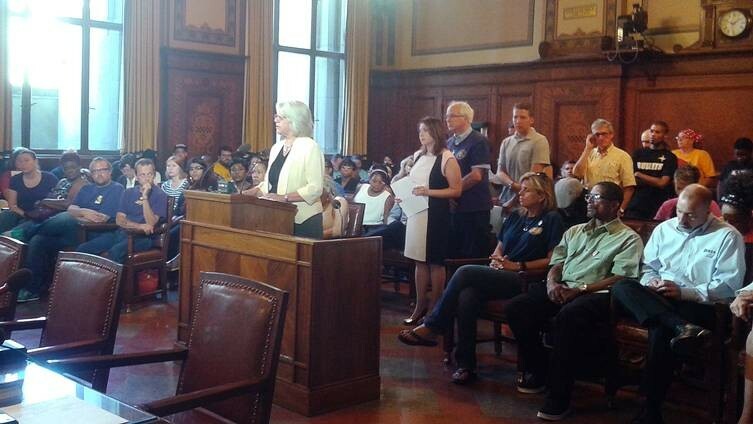 Kraus along with councilors Corey O'Connor, Deb Gross and Darlene Harris were present for the public hearing. The paid sick time bill (2015-1825), sponsored by Councilor Corey O'Connor, would require all employers in Pittsburgh to pay workers for accrued sick time. 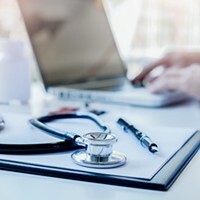 After the first round of changes, the bill now states that workers at businesses with 15 or more employees would earn one hour of paid sick time for every 35 hours worked and, according to the bill, an employee should "at no point ... have access to more than 40 hours of paid sick time, unless the employer designates a higher amount." For places with fewer than 15 employees, paid sick time is capped at 24 hours, or three work days. Workers already employed could begin accruing sick time as soon as the ordinance would pass; new employees would not be able to use accrued sick time until 90 days after they were hired. Workers would be allowed to use the time for their own illness or to care for a family member. Supporters called the bill "moral" and a "no brainer." 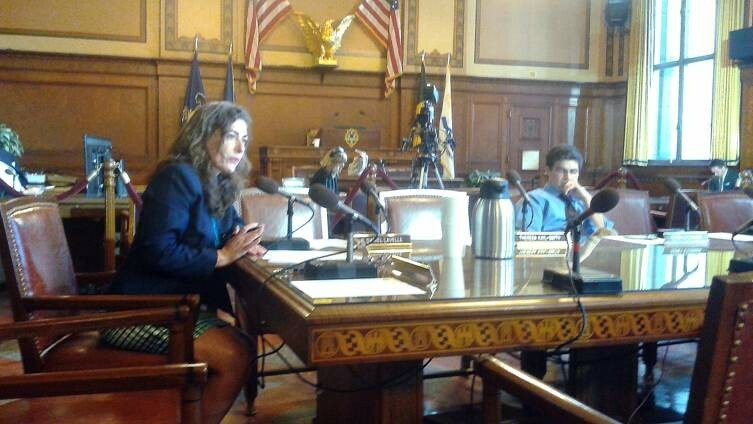 "We are deeply concerned that single mothers and their young children make up 71 percent of households living in poverty in the Pittsburgh metro area," said Heather Arnet, executive director of the Women and Girls Foundation of Southwestern Pennsylvania, in her public testimony. "This ordinance will help ensure that when that single mom gets a phone call at work that says that she is required to pick up her sick child at school immediately because he has a fever ... that mom will know that she can take care of her sick child, speeding up his recovery, and limiting his contact with others, while knowing her job is secure." According to the bill, 40 percent of private sector workers in the city don't have paid sick time, and 77 percent of food and healthcare industry workers lack such benefits. Councilor Deb Gross, co-sponsor, and Councilor Corey O'Connor, chief sponsor, speak after listening to public testimony. O'Connor told City Paper in early July that the bill is written as a public health measure. "You don't want an employee coming in and infecting others," he said. 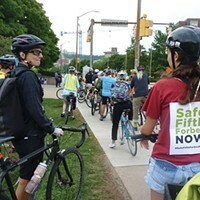 "Research from the University of Pittsburgh Medical Center shows that access to paid sick leave in Pittsburgh can result in decreased transmission rates for influenza," the bill goes on to state. But some small business owners and service-industry representatives who testified are worried about the cost of paid sick days, whether workers would abuse it and how quickly city council went from inception to a planned vote on the bill. The legislation was introduced on July 7. "The first place we heard about [the bill] was in the newspaper," said John Graf, of the North Side Chamber of Commerce. "This was a three, three-and-a-half -week process. Do not try to do it by the end of this session. In many cases, these are businesses that already offer paid sick time." "I've not heard the justification for the 18-year-old who is in his first job. That makes that employee that much more expensive," Graf said in his testimony, referring to the argument for people to be allowed to stay home and care for their children. Steve Shivak of the SMC Business Councils, based in Cranberry Township but which represents small businesses in Pittsburgh, told council members during his testimony that the bill lacked statistics and was written "without the city understanding finances of businesses." "The root cause of an unhealthy workforce is not businesses," he said. 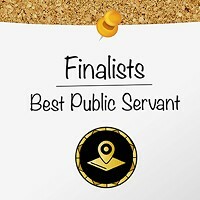 "Instead, the bill puts the ownership of health on the businesses ... [and] awards bad behavior." An employee's smoking, drinking, illegal drug use, and poor nutrition habits are not the problems of the business owner, Shivak said. "We're not opposed to paid sick days, but this is paid time off, not paid sick time," testified Jeff Cohen, chairman of the Pennsylvania Restaurant and Lodging Association. He gave the example of someone abusing the system and taking a paid sick day to go to Kennywood. Supporters of the bill in the crowd coughed loudly to interrupt and protest his testimony; Kraus called the crowd to order. 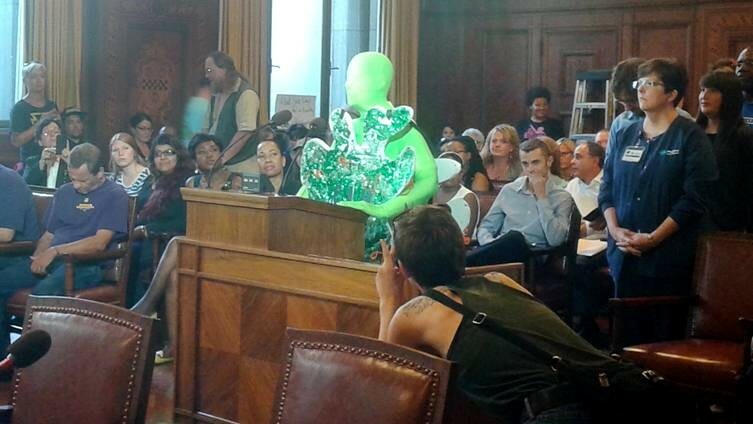 A protester testified as "Sam the Snot" in support of the paid sick days legislation. about people [in power] because they're the decision-makers. Are they taking days off to go to Kennywood? Are they taking illegal drugs?" Along with industry representatives, some small business owners also spoke out against the bill. "For someone to tell me what I have to do before they know what I can afford scares me," said Heather Nally, owner of the Mt. Washington restaurant Micro Diner. "I would never fire someone for calling off sick." Nally, who has gone through 50 employees in three years, says she already offers benefits for her employees, including a retirement fund for which she matches 3 percent. She told CP after the meeting that if the bill passes, she hopes that the 90-day wait period for an employee to use sick time is extended. At the end of the meeting, O'Connor said that council will "get a good balanced bill by Monday." Meanwhile, Harris expressed concern about the timeline of the bill. "I can understand that if something's going through so fast, you don't even know what it is," Harris said. "If it's too soon and I can't get the answers I need, I will abstain on this bill." City council will reconvene yesterday's meeting, which is technically in recess, on Monday at 9:30 a.m. to discuss amendments. Their regularly schedule meeting will take place at 10:00 a.m.